Sometime last week, New York became the sixth and most populous state in America to legalize gay marriage. The opposition(yes, all those church-goers) wept and screamed and shouted words-fit-for-infidels in their attempts to prevent this from happening. 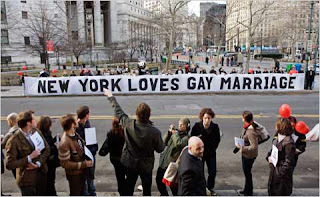 A sweet victory for gays in New York, and I suspect gay couples from all corners of New York would flock to register themselves before the archbishops, pastors and church-runners of New York force Mayor Bloomberg to change his mind. By the way, why do we dislike homosexuals? Gays and I do not share a common sexual interest, for I would probably frown in disbelief should a drop of male ejaculant other than my own landed on my skin, but I agree that they do have the right to choose a partner for themselves; a partner who will share your life, your downtime, your happiness. So it's completely natural for them to choose whomever they want, even if it means choosing a gay partner. Evolutionary wise, if every sexual creature fails to adhere to Nature's order to multiply (properly of course; no test tube, no in-vitro. Purely male-female mating procedure), then the entire species would extinct within a single generation. Homosexuality, if widespread, means an end to our species. 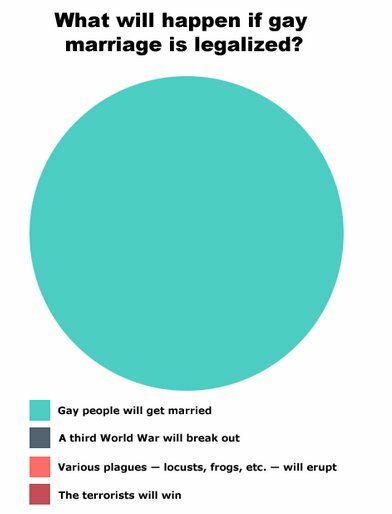 But since gays and lesbians make up only a tiny fraction of our 6 billion inhabitants on Earth, it wouldn't harm us as a species. But they will continue to be condemned by churches as nuisance of civilization propelling deeds which are evil in the eyes of the Lord. As for me, I wouldn't mind granting homosexuals their marriage certificate.